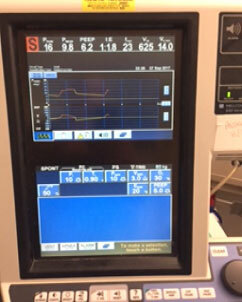 YOUR INTENSIVE CARE HOTLINE - How to wean off ventilation and tracheostomy step by step! IS IT TIME FOR MY DAD TO GO TO A STEP-DOWN UNIT AFTER HE’S COME OFF THE VENTILATOR OR IS IT TOO EARLY TO LEAVE ICU? In this week’s episode of “YOUR QUESTIONS ANSWERED“, I want to continue answering the next questions regarding James’ and Christine’s Dad in ICU who’s had a haemorrhagic stroke. James’ and Christine’s Dad had a brain decompression where they evacuated a large bleed from his brain after the haemorrhagic stroke. And their Dad also underwent a craniectomy (removal of skull) to decrease the brain pressures after the bleed. James’ and his sister Christine were getting their Dad in one of the best hospitals in the USA, the Cleveland clinic in Ohio. In the meantime, their Dad was getting a tracheostomy because he couldn’t be weaned off the ventilator and the breathing tube. He also had a PEG tube for feeding inserted. He also had ongoing seizures due to the stroke and his anti-seizure medications needed to be optimized so he could “wake up” and progress to Neurology Rehabilitation. I think the dropped the pressure support down to 8 from 10, what does it mean? Also, Oxygen saturation is 97. Where would I find ABG (arterial blood gas)? Yes they dropped Pressure support from 10 down to 8. Another good sign and they should be moving swiftly in taking him off the ventilator at least for a trial. You can also see that his tidal volumes on the top of the screen have dropped from 625 mls (last picture you sent) to 490 mls. The question there is what is his oxygen saturation, which you can see on the monitor and also what are his arterial blood gases (ABG) like? I assume they have stopped monitoring ABG’s for now. Also, his breaths/minute are 24 and should stay <30/min as a rate >30/min would indicate discomfort. ABG, you’ll only find if your Dad has an arterial line. Very happy for you or your sister to give me a call. My father is sound asleep. He looked great today. Eyes wide open and scribbled a bit on a piece of paper tried writing his name. We believe he understands what’s the doctors are saying and is becoming more anxious and angry because of it. Please advise of your thoughts and or suggestions. As explained we really need to seem him off the ventilator here and not in LTAC. The seizure doctor said he is keeping his dose of Keppra at 1500 2x/day and Dilantin 100mgs 3x/day for the next 3-6 months. What are your thoughts on the above ? I understand the more awake and alert he gets the more frustrated he might become because of his situation. Even if he’s making sense now, chances are he won’t remember any of it in the future. I do remember yesterday discussing about being transparent with him and generally speaking I support that, however if he’s getting too upset, you may want to soften your explanation of the situation slightly. Keppra 1,500 mg x2 still a high dose, Dilantin 3x100mg normal dose, the goal is to keep him seizure free, if they think that’s the dose that will achieve that, I would support that for now. It can be revisited at a later stage. As long as he keeps getting more awake, stays seizure free and can be weaned off the ventilator that’s the goal. please provide thoughts on ventilator settings. Still trying to make sense of it. My father is awake and alert right now. 11:30 at night. He had long nap. nothing has changed from last picture. The settings are still the same as far as I can see. What I can’t quite make out is the PS (pressure support). It looks like it’s sitting at 8 like in the previous picture. It could also read like 0, but that is unlikely and would be very unusual. The only thing that has changed is that his Tidal Volumes (volume in mls per breath) are slightly lower, 392 mls, compared to 490 mls in the picture you sent through earlier. That’s no big deal, as long as his oxygen saturation stays >92%. It’s most likely a sign of him being asleep. 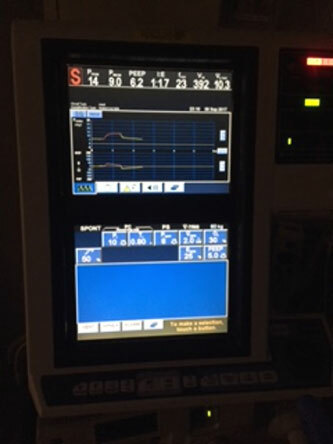 Those are good settings to get through the night, because they are minimal support and again he should have time off the ventilator very soon, I would suggest tomorrow day time. Do you know if he has an arterial line? this is James’ sister Christine. What are your thoughts on what we could be doing for rehab or exercises for my dad. He has been in the hospital bed for 4 and half weeks. As you know he is still on the tracheostomy with ventilation and still trying to ween him off the vent. ICU just started putting him in the once a day for an hour with a helmet on his head. What else can we do. I did notice a little water building up on his right side where he is expected to have problems due to the brain bleed on the left side. Also, the seizure team decided to keep him at 3000 mg Kepra and Dilantin 300 mg per day for next 6 months. What is your experience/ thoughts with this? In terms of rehabilitation, for now the focus will be to keep mobilising him and keep getting him out of bed. This can be supported by arm and leg movement. They should be doing this in the morning and in the afternoon for as long as he can tolerate it, including the movements of limbs. One hour per day is not enough as long as he can tolerate it and as long as he is seizure free. The longer he can sit out of bed, the stronger he will get and this includes strengthening his respiratory/breathing muscles that will help him to get off the ventilator and the tracheostomy. If he can go on to Neurology rehabilitation this would be preferred rather than LTAC, simply because the stroke rehab should be the focus and not weaning him off the ventilator, hopefully they can wean him while in ICU. As far as the Keppra and Dilantin are concerned, the Keppra dose is fairly high, whereas the Dilantin dose is fairly normal. However keeping your Dad seizure free for now is more important than worrying about the high doses of Keppra. 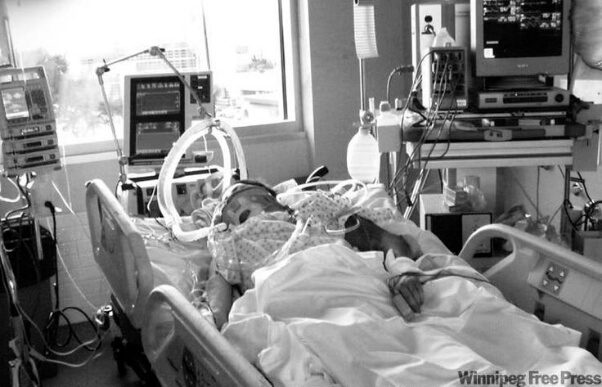 Seizures could set back your Dad, including weaning him off the ventilator. I hope this helps for now, please let me know if you want to discuss and I can give you a call. We are trying to consolidate. My Father has been on the tracheostomy collar 2 hours earlier and had been on for another hour now. That’s a great start! If they can continue doing that and continuously increase the time off the ventilator where he comes to the point he can stay off the ventilator during the day and being ventilated overnight, he will have come a long way. I hope that makes sense. Any questions please let me know.